THREE SHEETS Cheers to 3 – Anniversary Party! Can’t wait to celebrate three years of beers with you this Friday. Without each of you we wouldn’t be here and the journey definitely wouldn’t have been as much fun. 12p – Tapping special kegs we chose for this event from some of our favorite partners. And of course, no three year old’s party would be complete without a cotton candy machine and bundt cakes to celebrate! Come suport local! The parents of Wells Middle School’s Marching Band will be hosting a fundraiser at Three Sheets from (6-10p). If you get a wristband and say that you’re with Wells we will donate $1 for each pint sold. Join us for the Battle of the Bay on Wed, Aug 2nd and help Three Sheets win, “Best A’s Watch Party 2017”. Let’s show the Bay Area that the Tri-Valley is the place to be to root for your local baseball team! Three Sheets was chosen by the Oakland Athletics to host an Official Watch Party for the Battle of the Bay vs the San Francisco Giants…We are the ONLY bar in the Tri-Valley chosen to participate! What’s in it for you? Wear your Three Sheets baseball shirt (either team); Get $1 off of draft beer/cider during the game. 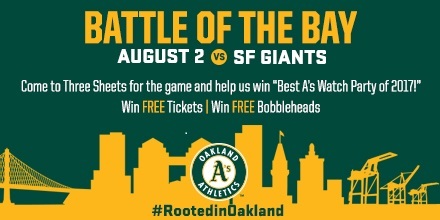 Chances to win FREE A’s Tickets, BOBBLEHEADS, and an ACTION FIGURE. How do you win FREE TICKETS? Buy one of the first 50 pints sold after the first pitch and you get a FREE A’s ticket…same thing after the 7th inning stretch. New funkadelic beer from 21A…Watermelon Funk! 21A has transformed their summertime watermelon wheat beer into Watermelon Funk, a mind blowing, shake your booty, interlocking sour bass lines with syncopated sweet fruit notes and downbeat aromas and they give you all that in a signature groove with the hip and sway of Lady Liberty. We’ll also have Hell or High Watermelon Wheat, Blah Blah Blah Double IPA, and Brew Free or Die IPA.